The 10-day tour crossed the entire country, from the Kinneret (Sea of Galilee) to Eilat. We encountered activists, educators and researchers. Wherever we went we saw projects just waiting to get off the ground. These projects ranged from educational programs to exciting new technological research, community campaigns and personal initiatives. Each faced its own set of challenges, some financial, some social and some political, but each was waiting for the support needed to let it blossom. It is important to acknowledge linkages between ourselves and the people of Israel, the land of Israel and the global environment. Even neutralizing our carbon footprint or otherwise reducing our environmental impact in North America can have an influence on Israel’s environment. On the trip we met olim (immigrants) who have become leaders in Israel’s emerging environmental scene. They have become new chalutzim (pioneers) — educated, motivated and enthusiastic immigrants ready to bring environmental responsibility to a country that desperately needs it. Many of us are familiar with the works of notable environmental pioneers like Dr. Alon Tal and Dr. Eilon Schwartz, both of whom have been instrumental in establishing some of the leading environmental organizations such as the Israel Union for Environmental Defense, the Arava Institute for Environmental Studies, the Heschel Center and the Green Zionist Alliance. Yet other new olim are moving to Israel to help its environment. Here is the story of three emerging leaders and how their organizations are making a difference. Raised in Seattle, Joshua Berman made aliya with his wife Tali in 2003. They live in a moshav outside of Jerusalem. Tali is the founder of the Meir Autism Treatment Center and Josh helps run a number of e-commerce Web sites. Josh has been volunteering his time to bring the Good Energy Initiative to the American Jewish community and the world. The Good Energy Initiative is an opportunity for individuals, synagogues and organizations to offset their carbon footprint by supporting grassroots carbon-reduction initiatives in Israel. Thanks to Joshua's efforts, activities including conferences, bar mitzvahs and day-to-day business operations are offset by purchasing solar water panels for underprivileged Israelis who could not otherwise replace their kerosene heaters, and by distributing energy-efficient light bulbs to Israeli schools and children. Born and raised in Stockholm, Sweden, Andrea Weil made aliya in 2000 with a desire to help Israel protect its marine environment. Noticing that very little about human impacts on the Mediterranean Sea was being researched or taught in Israel, Andrea approached a group of scientists from the marine research field and together they founded EcoOcean in 2003. EcoOcean´s main resource is the research vessel R/V Mediterranean Explorer, used by marine researchers from universities throughout the country. Additionally, EcoOcean operates a number of educational programs intended for a wide range of ages, including the "Megalim" Center for Educational Activity at Michmoret for the study of marine and environmental sciences. Experts from EcoOcean visit elementary schools and high schools across the country to lecture on marine ecology and biology-related issues. Born and raised in Atlanta, Leiba Chaya David made aliya in 1996 eager to explore the land with a Tanach (Bible) in one hand and a water bottle in the other. Like many of the early Zionist naturalists, Leiba Chaya's connection to the land is central to her Jewish and Israeli identities. Working first as a guide for the Society for the Protection of Nature in Israel, she now coordinates SPNI’s inner-city campaigns, community initiatives and educational projects for both secular and religious schools. Leiba Chaya hopes to use her understanding of Jewish education to help coordinate educational projects that will connect the North American and Israeli communities through care of the land and the environment. 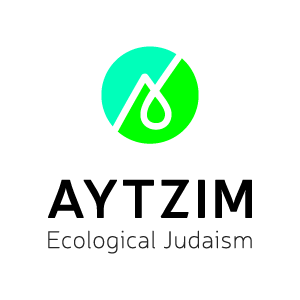 With the help of the new eco-chalutzim, Diaspora Jews are connecting to Israel through environmental concerns — and preserving the land of Israel is becoming a sacred mission. "The negative connotation of a swamp, or of the desert, as if they are not humane places, is something of a distortion, an un-ripe idea. With time, this misconception will pass."